The vibrantly colored green smoothie recipes below are a great way to incorporate significant amounts of greens into your everyday diet. Believe it or not leafy green vegetables contain more beneficial nutrients than any other food group. To receive the full benefits of eating these leafy green vegetables you would need to chew your food down to a creamy smooth texture, which regrettably most of us don’t do. 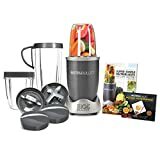 Fortunately with the best blender for green smoothies we can recreate this process, allowing our body to absorb the highest amount of nutrition that it could possibly get from a green smoothie recipe. Flax seed are quickly becoming the new wonder food of today, packed full of Omega 3 and 6 oils these high fiber high protein seeds takes this healthy green smoothie way off the charts for heath benefits. Flax seeds need to be bruised or ground to reap their benefits so unless you have a high speed blender like a Blentec or Vitamix you may prefer to substitute the seeds for oil. Place all the ingredients into the blender in the order they have been listed and blend until smooth. This flavorsome smoothie is a great way to boost your vitamin A and C intake, as this orange tasting smoothie contains 3 times the daily requirements. Place all the ingredients into the blender jug in the order they are listed and blend until smooth. This is one of my favorite tasting green smoothie recipes, it’s thick, sweet and creamy, plus it’s packed full of vitamin A and C.
Place all ingredient into the blender jar in the order to which they appear. This is a pretty thick green smoothie, so if you have an ice crush program on your blender select that first, then blend as you would any smoothie. Otherwise blend on hi until all ingredients are well blended scrapping down the sides if needed.